Joseph Brodsky (May 24, 1940 – January 28, 1996), born Iosif Aleksandrovich Brodsky (Russian: Ио́сиф Алекса́ндрович Бро́дский) was a Russian emigre poet and essayist who won the Nobel Prize in Literature (1987) and was chosen Poet Laureate of the United States (1991-1992). Brodsky was an ambassador for the power of poetry to transform minds and hearts. For Brodsky, poetry clearly had a spiritual power that mattered. This view was no doubt instilled by his experiences in Soviet Russia, where due to widespread censorship, his own poetry could not be published in the official Soviet publications. Brodsky did not shy away from the horrors he experienced in the twentieth century. His poems confronted issues of life and death and the psychological ramifications of life's struggles, including depression and insanity. Still, his poetry is often considered therapeutic for his embrace of life through the liveliness of his language and the esprit of his imagery. He believed in the power of poetry as a witness to the truth that would ultimately not be silenced. Brodsky was born into a Jewish family in Leningrad, the son of a professional photographer in the Soviet Navy. In early childhood he survived the Siege of Leningrad. When he was fifteen, Brodsky left school and tried to enter the School of Submariners (школа подводников) but without success. He went on to work as a milling machine operator (фрезеровщик) at a plant. Later, desiring to become a physician, he worked at a morgue at the Kresty prison. Subsequently, he had a variety of jobs, including working in a hospital, in a ship's boiler room, and on geological expeditions. At the same time, Brodsky engaged in a program of self-education. He learned English and Polish, acquiring a deep interest in classical philosophy, religion, and mythology, as well as English and American poetry. Later in life, he admitted that he picked up books from anywhere he could find them, even garbage dumps. Brodsky began writing his own poetry and producing literary translations around 1957. His writings were apolitical. The young Brodsky was encouraged and influenced by the Russian poet, Anna Akhmatova, who, in turn, appreciated his poetry, calling some of his verses "enchanting." Brodsky: I think that it...comes from God. For his "parasitism" Brodsky was sentenced to five years of internal exile with obligatory engagement in manual labor, serving 18 months in the Archangelsk region. The sentence was commuted in 1965 after prominent Soviet and foreign literary figures, such as Evgeny Evtushenko and Jean Paul Sartre, protested to the authorities. In 1964, Leonid Brezhnev came to power. As the Khrushchev Thaw period ended, only four of Brodsky's poems were published in the Soviet Union. He refused to publish his writings as they could only be published after undergoing state censorship. Most of his work appeared only in the West or in samizdat, or self-publication, a well-known method to escape Soviet censorship. Some poems were published in New York in 1965 and again in 1970. Brodsky's poetic reputation was largely earned in exile. On June 4, 1972, Brodsky was expelled from the Soviet Union, emigrating to the United States of America and becoming a U.S. citizen in 1980. His first teaching position in the United States was at the University of Michigan (U-M). He also became Poet-in-Residence and Visiting Professor at Queens College, Smith College, Columbia University, and Cambridge University in England. He was a Five-College Professor of Literature at Mount Holyoke College. He achieved major successes in his career as an English language poet and essayist. In 1978, Brodsky was awarded the honorary degree of Doctor of Letters at Yale University, and on May 23, 1979, he was inducted as a member of the American Academy and Institute of Arts and Letters. In 1981, Brodsky received the John D. and Catherine T. MacArthur Foundation's annual award. In 1986, his collection of essays Less Than One won the National Book Critic's Award for Criticism. In 1987, he won the Nobel Prize for Literature, the fifth Russian-born writer to do so. He was questioned about his identity in an interview at the Stockholm airport, "You are an American citizen who is receiving the Prize for Russian-language poetry. Who are you, an American or a Russian?," he responded: "I am Jewish". 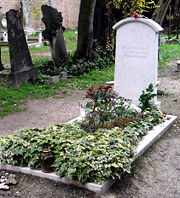 Brodsky died of a heart attack in his New York City apartment on January 28, 1996, and was buried at Isola di San Michele cemetery in Venice, Italy. Poets who influenced Brodsky included Osip Mandelstam, W.H. Auden, Robert Frost, and Stephen Spender. A recurring theme in Brodsky's writing is the relationship between the poet and society. In particular, Brodsky emphasized the power of literature to positively impact its audience and to develop the language and culture in which it is situated. While he dealt with themes of life and death and struggle, his poetry transcended the dark subject matter through its sheer exuberance. His images address the tenuous nature of human existence and the fragility of life in a foreboding world, but he is not driven to pessimism, but rather accepting and appreciating the paradox. The place where I am is paradise. Because paradise is a place of helplessness. as of a mountain. Above there's only air, and old Chronos. Preserve these words; for paradise is a dead end. A cape stuck out into the sea. A cone. He was an apostle for the power of poetry, suggesting that the Western literary tradition was in part responsible for the world having overcome the catastrophes of the twentieth century, such as Nazism, Communism and the First World War and Second World War. During his term as the Poet Laureate, Brodsky promoted the idea of bringing the Anglo-American poetic heritage to a wider American audience by distributing free poetry anthologies to the public through a government-sponsored program. This proposal was met with limited enthusiasm in Washington, D.C. Were we to choose our leaders on the basis of their reading experience and not their political programs, there would be much less grief on earth. I believe-not empirically, alas, but only theoretically-that for someone who has read a lot of Dickens to shoot his like in the name of an idea is harder than for someone who has read no Dickens. ↑ The original transcript reads: Судья: А вообще какая ваша специальность? Бродский: Поэт. Поэт-переводчик. Судья: А кто это признал, что вы поэт? Кто причислил вас к поэтам? Бродский: Никто. (Без вызова). А кто причислил меня к роду человеческому? Судья: А вы учились этому? Бродский: Чему? Судья: Чтобы быть поэтом? Не пытались кончить Вуз, где готовят... где учат... Бродский: Я не думал, что это дается образованием. Судья: А чем же? Бродский: Я думаю, это... (растерянно)... от Бога... The translation is taken from Remembering Joseph Brodsky by Cissie Dore Hill at Hoover Institution Archives. Retrieved January 9, 2008. ↑ Works and Days. A Jew or a Hellene? chapter by Simon Markish. Retrieved January 9, 2008. Труды и Дни (Works and Days, 1998) Edited by Pyotr Veil and Lev Losev (Online) Retrieved January 9, 2008. Hill, Cissie Dore. 2000. "Remembering Joseph Brodsky." Hoover Digest: Hoover Institution Archives. Stanford University. This page was last modified on 6 June 2018, at 21:31.